There may be hundreds of wonderous pool images that you may have seen on various social media sites such as Facebook or Instagram and you may have longed to visit each of them. Here is a list of some of the best swimming pools of the world to immerse yourself in and experience a feeling of utmost bliss and relaxation. The Serenity pool at this resort is stretching to almost one-hundred-foot-long lap and is reserved especially for adults and does not allow children to avoid any kind of unnecessary disturbance to the serenity and calm of the pool. 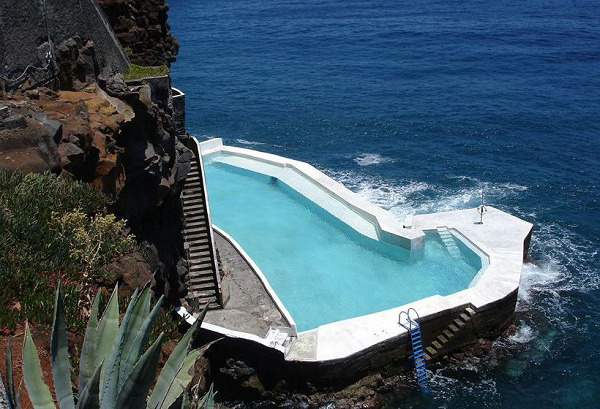 There are two pools nestled together, with the larger pool that juts out into the sea and the smaller pool that is within it. It is one of the most relaxing places in the world to take a swim and submerge yourself in this white and blue paradise surrounded by palm trees for a complete sense of relaxation and calm. 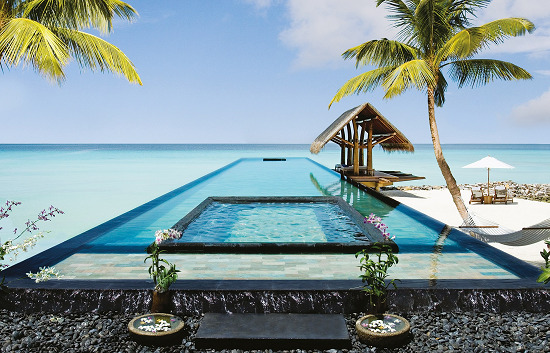 The design of the pool in minimalistic which is gives it a stylish and sophisticated feel. The pool also features a small stone bed with a jacuzzi which helps you to recuperate and relax after a long day. The spectacular swimming pool at the hotel is truly one of the finest architectural masterpieces that you will ever witness. The infinity pool is suspended in the cliff at a height of approximately 1150 feet above the sea, this accords you with the feeling of swimming in the sky. 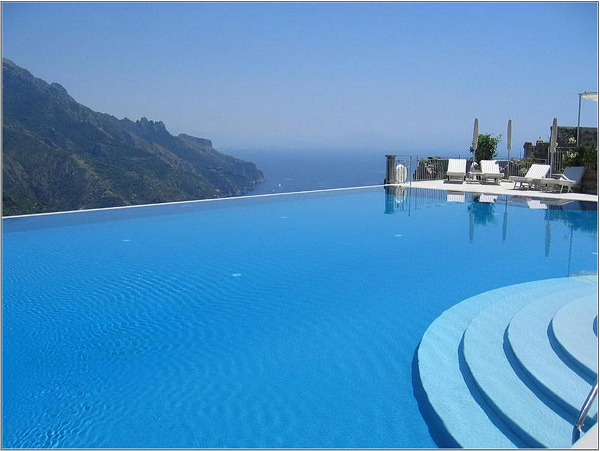 Overlooking the pool is the breathtaking view of the wonderful Amalfi coastline. The hotel is set in the Old Dallas National Bank building, and the pool hangs off the balcony of the top floor overlooking the city. It is truly a great way to escape from the hustle of the city life. 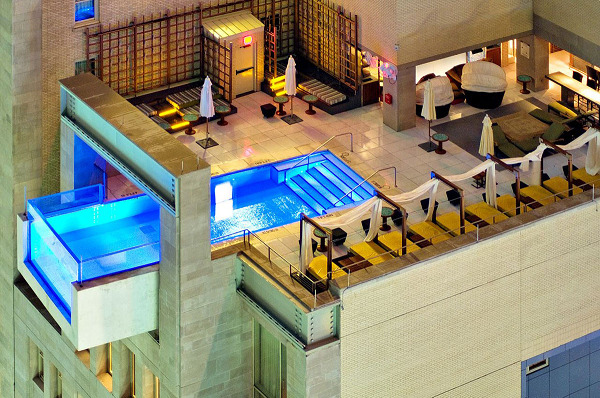 The pool extends from the tenth floor and reaches out to the Main Street, Dallas. It has an eight-foot-long projection and a glass wall towards the end. #Tip: Make it a point to carry a water-proof camera when you visit the pool to boast and rave on social media about your experience! 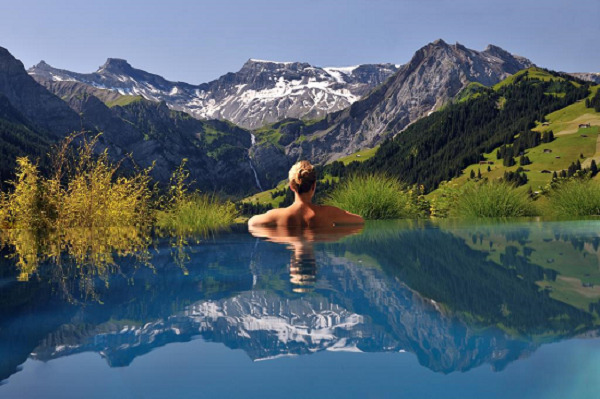 The pool offers one of the most picturesque locations between the magnificent Swiss mountains. It provides a perfect contrast of swimming in the warm pool along with the cold exteriors. The pool is heated to a temperature of about 32 degrees Celsius, which helps to keep it warm in contrast to the cool climate. The warmth of the pool also acts as an effective healing mechanism to any kind of body aches that you may experience. This infinity pool is perfect to give you one of the most blissful experience. The look of the whole scenery looks magical like it is just out of a Christmas card! The hotel is located on the beach with a beautiful pool which acts as one of the main attractions of the hotel. The pool has individual islands of relaxation which is created for each guest to enjoy their own privacy in this calm and peaceful environment. The pool accords the feeling of a turquoise blue oasis since it is nestled in between a jungle. The color of the pool blends well with the color of the environment creating a superbly amazing experience. The floating pavilions in the middle of the pool are just ideal for that perfect nap or relaxing conversations. There is also a jacuzzi on one side of the pool if you wish to experience some invigorating water therapy. The pool gets even more spectacular with the stunning spotlights at dusk. It may happen when you are on that romantic swim with your partner, that you wish to experience complete privacy. 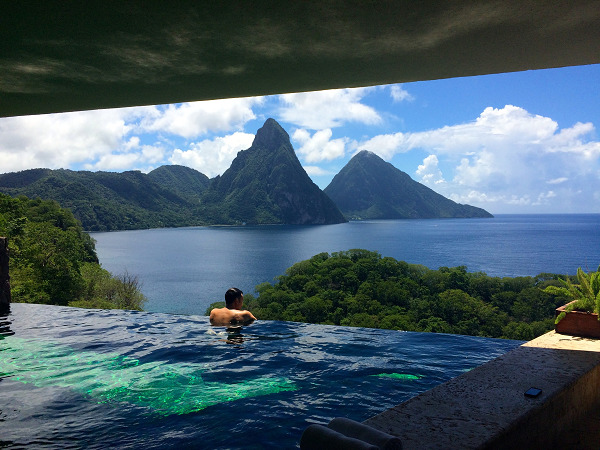 In this case, the ideal place for you is the Jade Mountain at St Lucia. Here, you have the option of choosing from twenty-four sanctuary style accommodations which featuring its own individual infinity swimming pool. The pools are truly wondrous which merge visually with the Carribean Sea. 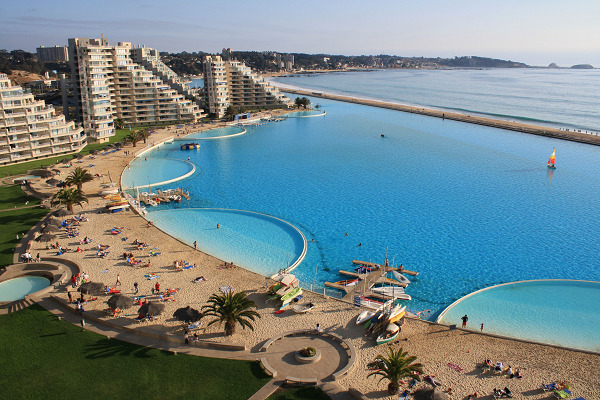 This is one of the best swimming pools and also one of the most photographed swimming pools in the world. If swimming pools were people, this one would definitely be a movie star. 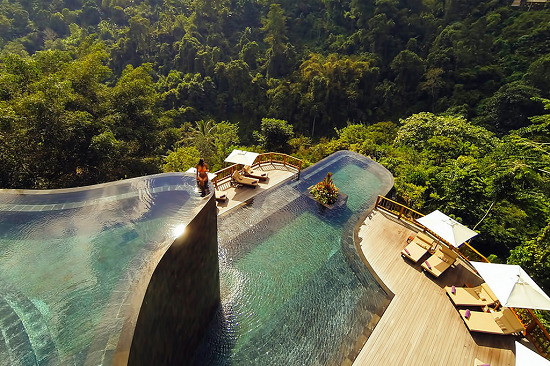 The only thing which is better than one infinity pool is two infinity pools. The pool consists of two decks that are the upper deck and the lower deck. The upper deck flows from the bar while the lower deck provides more privacy for a quiet and peaceful relaxed swim. While swimming in the top pool you get the view of the tree canopies surrounding the jungles and also the view of the beautiful infinity pool below. In the lower pool, you have the liberty to walk down the stone steps into the crystalline depths or lay on the central island or just chill near the pool listening to the soothing sound of the water. 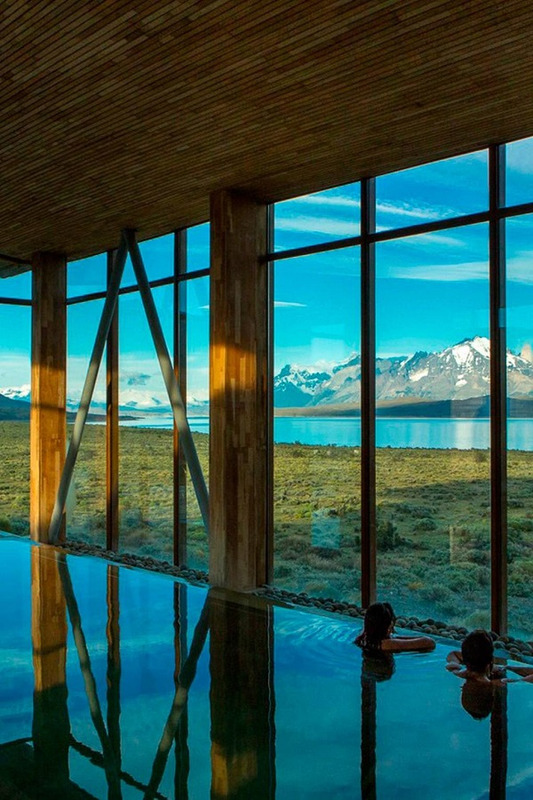 Chile has truly transformed the meaning of the word pool and taken it to an all new level, making it home to the longest and deepest pool of the world. The pool is almost 62 miles long and 115 feet deep. Standing on the edge of this pool gives you the illusion of stepping into the ocean. Love water sports and adventure activities? Then look no further because we have found the perfect pool for you. Guests are not only able to swim in this pool but they are also able to take their kayaks and sailboats in the water. At the San Alfonso del Mar you can also pump your adrenaline further by snorkeling and scuba diving. This pool with its beauty and magnificence is like a lion of all pools especially recommended for that adrenaline junkie in you. 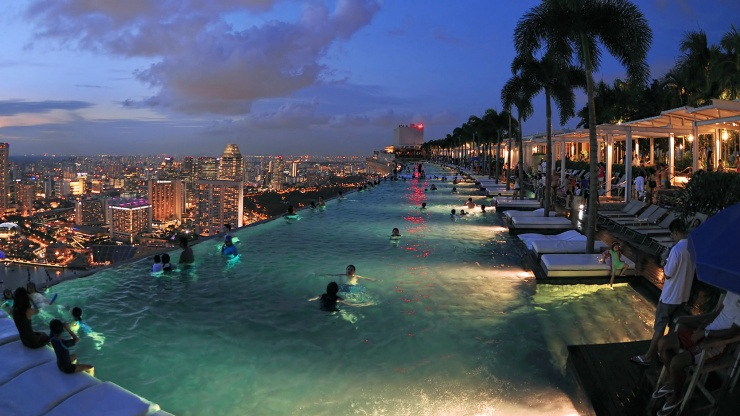 The infinity pool at Marina Bay Sands, Singapore is truly one of the most spectacular and marvelous infinity pools of the whole world. The pool stretches through a distance of almost 50 meters and located 57 stories high which consists of the tree super luxury towers of the Marina Bay Sands hotel. It offers breathtaking and mind-blowing views of the city and is in its utmost glory during dusk and nighttime with the gleaming view of the city lights and the superbly illuminated swimming pool. 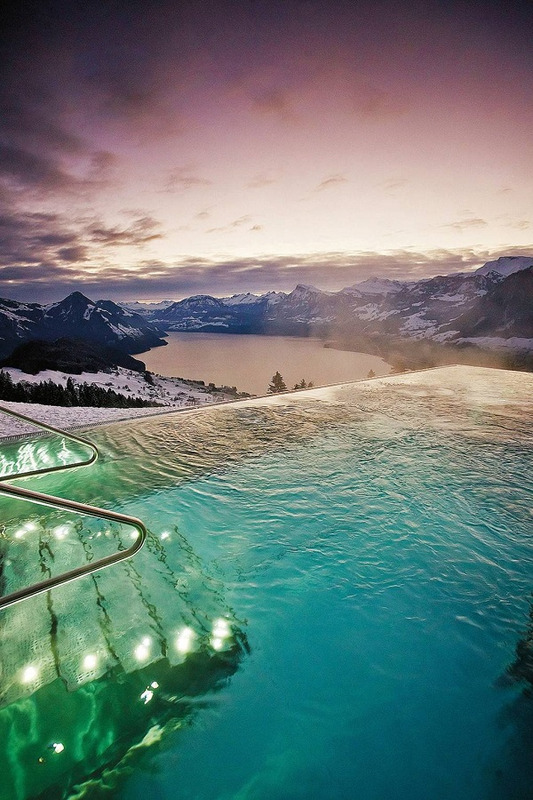 The view of this pool leaves you utterly speechless. The hotel is situated at a clifftop where the calm waters of the pool truly compliment the blue sky. You have experience something different with each time that you decide to take a dip in the pool. During the daytime, you can experience the view of the vast coastline, while during the evening you experience the play of the fiery colors in the sky as you witness the beautiful sunset. The night time view is equally marvelous with the underwater lighting of the pool which is simply striking. 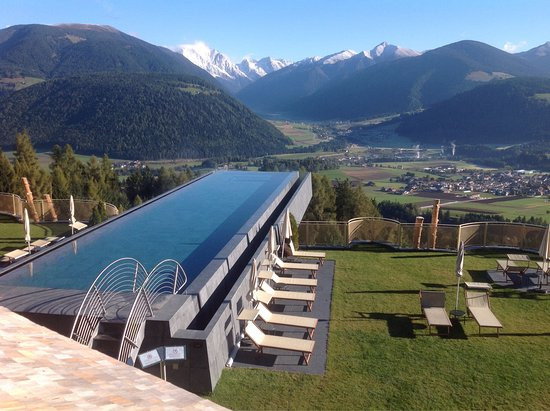 The sky infinity pool at Alpin Panorama Hotel, Hubertus, is truly one of the most spectacular pools that you will ever visit. The pool, as opposed to other infinity pools, does not give the feeling of meeting the ocean but it fuses with the color of the sky. The Sky pool is 80-foot-long and forty feet above the ground which gives you the illusion of flying and swimming in the sky. The views of the pine-clad mountains are even more wonderful when seen from the pool. This golf hotel has a completely wonderful and breathtaking view, which is surrounded by the North Atlantic Ocean. The Madeira Island is perfect for a swim, surf, hike, sail, and golf, with the marvelous pool as one of the main highlights of the place. 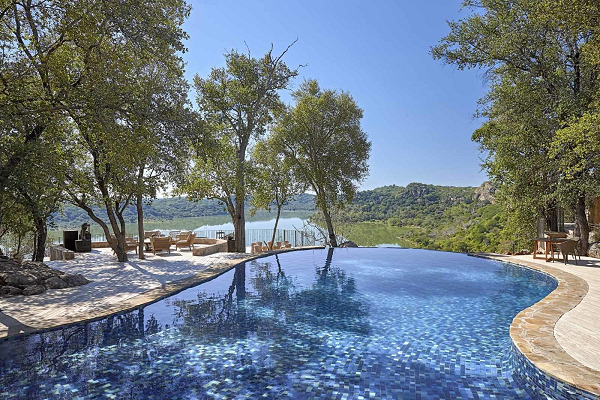 This safari lodge is nestled in between the treetops of overlooking the spectacular Zimbabwe landscape. 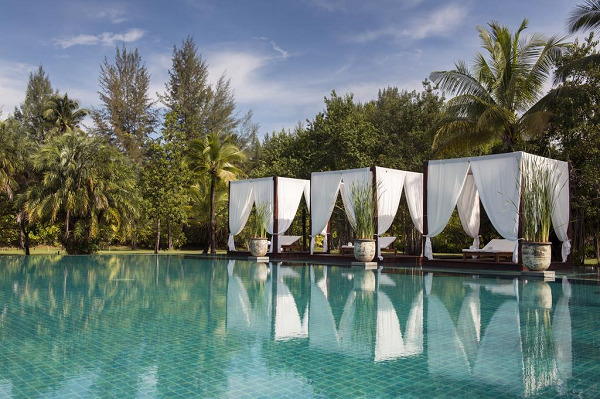 This pool is truly the perfect honeymoon escape for you and your partner. The pool is the perfect blend of romance and adventure giving you the perfect honeymoon escape. 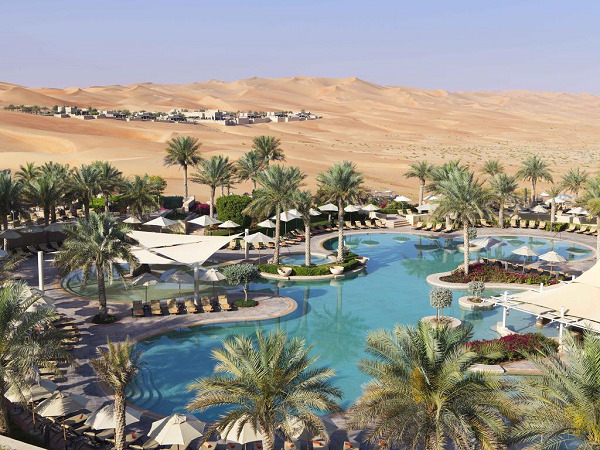 The resort is set in the Liwa desert where the temperatures are known to touch almost 40 degrees Celsius. The glimpse of the marvelous pool in the resort truly acts as a mirage in the scorching heat. So, lose yourself in this majestic five-star kingdom style. 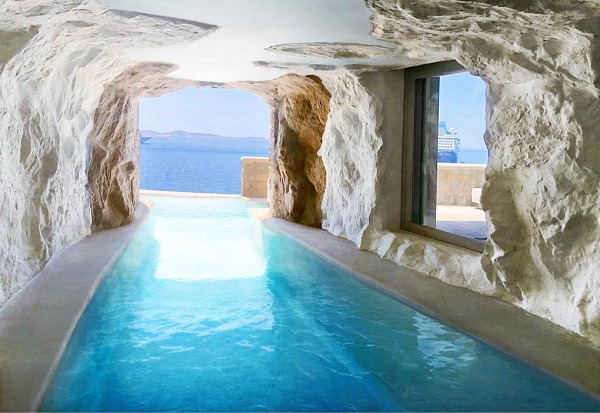 This pool set in a cavern is truly unique and Instagram worthy which is totally unusual and unique. What’s great is that you can easily enjoy the beauty of this suite when you stay at the Cave pool suite. It is a fully covered pool where you can recline and relax and create the perfect romantic atmosphere by lighting a few candles before sunset. Mykonos is home to super luxurious restaurants, bars, and beach clubs. But this little haven will be the most amazing place to return to after a long day of rosé and music. 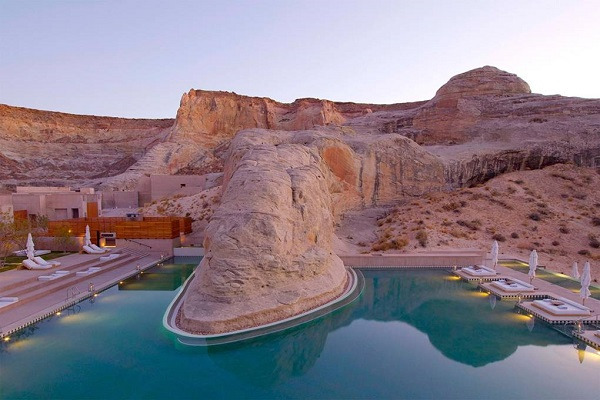 Amangiri comes from the Sanskrit word ‘Aman’ which means peace and ‘giri’ which means mountain. This is truly a very special place in Utah. It has a beautiful architecture with a unique pink colored stone set in an arid desert landscape offering you with complete and utter seclusion. This unique spa and hotel simply blend in with its surroundings, while the pool sits resplendent at the center of it all. Patagonia is one of the most serene and beautiful places which remind you of the beauty of Mother Nature. The pool is set in a vast and diverse terrain which is breathtaking and offers you the perfect pool setting that you can ever imagine. 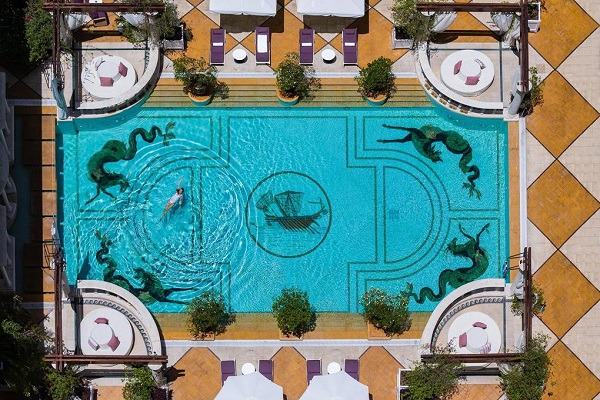 The Amytheste Pool at Beirut's Phoenicia Hotel is a destination of itself. The pool has a wonderful architecture with a Roman-esque style floor, and the whole pool exudes a feel of elegance and glamour. You can easily hear the upbeats of the DJ and enjoy some tantalizing cocktails to make it the perfect party. It is one of the great places to hang out during the evening if you want to enjoy the glamour and style of the place. But this isn't flip-flops and towels – you'll need your embellished kaftan, big sunglasses, and a little bling to blend into the glamour of this place. The pool helps you to enjoy a wonderful and breathtaking panoramic view. The pool is set in Switzerland at the height of 914 meters above sea level, although you may be surrounded by snow-capped peaks and icy air by the water is heated at a temperature of 34 degrees Celsius, giving you the perfect blend of warm and cold and rendering you with one of the most memorable experiences of your life. 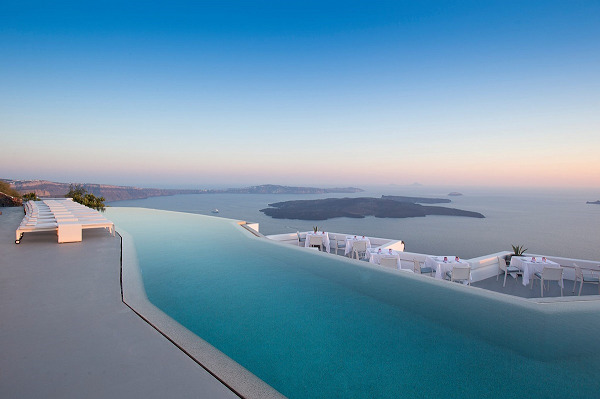 Here was a list of some of the best and most luxurious swimming pools of the world. So, loosen your purse strings, pack your swimwear and sunglasses for the perfect dip in some of the most marvelous pools in the world and get that perfect combination of relaxation and bliss.